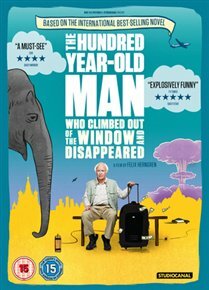 Swedish adventure comedy based on Jonas Jonasson's bestselling novel. Swedish adventure comedy based on Jonas Jonasson's bestselling novel. Despite having reached his 100th birthday, Allan Karlsson (Robert Gustafsson) still has a sharp mind. Keen to avoid the party that his retirement home have organised for him, Allan climbs out of his bedroom window and begins an escapade featuring criminals and a stash of drug money. Allan, however, is not new to adventure - during his lifetime he was involved with many significant events which changed the course of history and became associated with world leaders and other notable figures along the way. Despite having reached his 100th birthday, Allan Karlsson (Robert Gustafsson) still has a sharp mind. Keen to avoid the party that his retirement home have organised for him, Allan climbs out of his bedroom window and begins an escapade featuring criminals and a stash of drug money. Allan, however, is not new to adventure - during his lifetime he was involved with many significant events which changed the course of history and became associated with world leaders and other notable figures along the way.